The DOJ report on Ferguson highlighted the circulation of racist emails by police and city officials. Among the first fired in Ferguson were city officials who circulated those emails, such as Court Clerk Mary Ann Twitty. 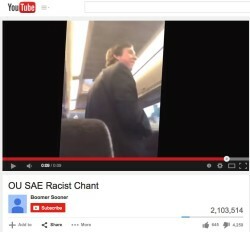 Within days of the DOJ report about racist emails, a YouTube video of a racist chant by SAE fraternity members, went viral with more than 2 million views in the first 24 hours. The video, and the protests that followed, resulted in the swift closing of the fraternity’s house on OU’s campus and the expulsion of several students. The irony, of course, is that while outrage about racist emails and videos leads the news and trends on Twitter, young black men – like Tony Robinson and Anthony Hill most recently – continue to die at the hands of police with alarming regularity. He’s right, of course. But there’s something else going on with the videos and racist emails that I no one’s talking about, and that’s the way that these things circulate and what that tells us about race, technology and call our culture. 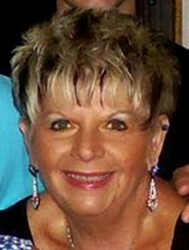 Mary Ann Twitty and her white co-workers at the Ferguson Police Department routinely shared racist emails with each other. This is commonplace in American workplaces, as even conservative FoxNews reader Megyn Kelly acknowledges (she just think that should negate the DOJ report on Ferguson – because everyone else is doing it too, I guess). The forwarded racist email presumes a particular kind of audience: a receptive, like-minded reader. Mary Ann Twitty lost her job for sending racist emails, but it’s not clear that the emails were original content that began with her. 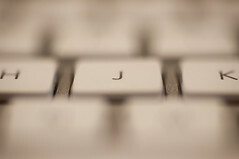 If the responsibility for such email content rests solely with one sender and ends before it gets to the recipient, then it is a peculiar kind of individual responsibility for something – forwarding emails – which is in reality a type of collective activity. Similarly, the video of the racist chant on the SAE bus at OU was circulated on Snapchat by friends of Parker Rice, Levi Pettit because it was the kind of thing that they and their friends felt comfortable sharing. They anticipated an audience filled with an imagined community of their like-minded, white college student friends. That racist jokes and stories and, yes, chants are circulating among white friends and family in ways that are routine and that go unchallenged is, in some ways, not new. White people have long shared racist comments in white-only family gatherings or friendship groups. This is what’s known as the “backstage” . Leslie Houts Picca and Joe Feagin have collected extensive data on this phenomenon and written about it in their book Two-Faced Racism. The upshot of thousands of data points is that in white-only spaces white people tell racist jokes because they think such conversation will find a receptive audience. And, the evidence suggests, that it mostly does. Remarkably, what most white people sending racist emails or recording racist videos fail to consider is that other people in the “frontstage” — people who are not in their family or their immediate friendship circle and people who do not share their whites-only worldview – may not be such a receptive audience. Instead, what happens now with this technology is that it can be used to call out people who behave in racist ways and expose such behavior to wider scrutiny. This is part of what has been referred to as “call out culture,” and not everyone is a fan of it because they see it as destructive to left-leaning causes because it’s a kind of eat-your-own quality. If the combination of call out culture and digital technologies can be used to expose and de-sanction white supremacy – and that’s really what connects Ferguson and the guys on the Sig’s bus – then that is a very good thing that we should be encouraging. Liberate all the racist emails from the police departments and offices in the country. Expose them. Record those racist jokes at your next all-white meeting, and post it on YouTube. Call it all out. Then, maybe we can begin addressing the dead black bodies in the streets. Microsoft has developed and filed a patent for a new “Avoid Ghetto” GPS app. The app connects to your smartphone (or dashboard GPS) and let’s you know when you’re getting close to a neighborhood with high rates of (street) crime. On the other hand, consider how this app could potentially help wayward drivers in some cities. In Detroit, for example, the city has a central downtown from General Motors headquarters up Woodward Avenue to Ford Field and Comerica Park where comparatively little crime happens. But just a few blocks outside that area, and a driver can find himself amidst streets of abandoned buildings and street-gang territory. Although this is speculation, I’m sure this is just what the app developers had envisioned when they created this bit of software. It’s all very Bonfire of the Vanities, really. Why if Sherman McCoy had this app, he’d have never gotten into all that trouble in the Bronx. But that’s just it, the app doesn’t track the kind of crimes that are really damaging to society as a whole, say, like bank fraud or subprime mortgage scams by “Masters of the Universe” like McCoy. No, in this app, crime only happens one way: between dangerous street thugs (read: black and brown people) and drivers (read: white people). This quote is an interesting rupture in the usually ‘colorblind’ discussions about technology, yet the element of race is so clear, Lanctot wants to distance himself from the implications of what he’s saying. It some ways it’s also a revealing moment about the white fear of crime (part of the white racial frame) and the construction of so-called ‘bad’ neighborhoods as always black or Latino. The reality is that “high risk” neighborhoods are most dangerous to those who are living in them (that is, predominantly black and brown people), not the white people who are driving through them.